Perfecting Bioretention. A key role you can play in the Network is to provide your perspectives and help develop updated Bay-wide design specifications for innovative stormwater practices. Our first target is bioretention, which hasn’t been over-hauled in more than a decade, despite a flood of new research and a lot of anecdotal reports on installation problems. So I took a first crack at the next generation of bioretention design specifications. The recipe: What’s the best mix for bioretention media? Can someone recommend a good spec to measure the soil-P index value which appears to be so crucial in phosphorus removal? Delaware is unique in that it adds peat to the mix—Does this expensive ingredient make sense in the coastal plain? Is the NC mix a cheaper media mix that still works? And, should spec require that the media be procured from a certified vendor or is still OK to mix it up a batch in the field? The surface cover: Research indicates that a surface layer of turf or river stone may perform as well as mulch, which would reduce the cost of replacing the mulch every few years? Can someone find a good reason why we can’t have some flexibility in the surface cover? The bio: There are no shortage of bioretention plant lists, and they seem to go on forever. After a decade, can we identify the top ten perennials, shrubs and trees that flourish in most Bay bioretention areas, and are commercially available from nurseries (I really go for day lilies). Does it make sense to restrict the list to plants that are native to the Bay watershed, or is this overkill? The sequence: Bad installation seems to be the bane of bioretention. The new spec proposes a more formal construction sequence to follow, as well as construction inspection checklist. What’s the right balance between doing the job right versus driving up the construction cost? The poor soils: The prospects of getting much infiltration is low for sites with C and D soils. The proposed spec has a stone storage layer at the bottom of the bioretention area (but below the underdrain). Has anyone else tried this concept? Does anyone have a good schematic? What potential maintenance and nuisance problem might this create? The contributing drainage area: Does it make sense to have a maximum contributing drainage area to the bioretention area? or at least a two cell pretreatment requirement? How can designers assure that they actually get the right CDA to actually drain to their bioretention area? The sizing rules: I have always thought using Darcy’s law to size bioretention areas is serious overkill, and have proposed some simpler sizing rules. Also, the real message from recent research is the need to maximize runoff reduction — the spec outlines a Level 1 and 2 design that provides different levels of annual runoff reduction. Is this a keeper or not? The infiltration rate: The spec contains a fairly ancient method for determining the underlying soil infiltration rate, which is critical, of course, in determining whether or not to use an underdrain. Anyone out there have anything better? The karst and coastal plain: How does one adapt the basic bioretention design to prevent sinkhole formation in the ridge and valley or deal with the flat terrain. low head and high water table of the coastal plain? I have offered a few thoughts, but need some serious help here. The bad sites: Everybody loves bioretention, but we all have seen bad bioretention failures. Is is worth adding some feasibility constraints to reduce the possibility of failure without unduly restricting its widespread use? The inflow and overflow: Anybody have some good photos/design drawings of unique inflow and overflow devices to bioretention areas? Bioretention is beginning to get a bad name as a result of poor construction and maintenance in some communities. The actual installation of bioretention areas is much more sophisticated and complex than many bioretention advocates admit. To improve the bioretention product, CSN has produced a short slide show outlining the proper construction sequence to install a good bioretention area. The show is primarily geared toward designers, plan reviewers and contractors. Let me know if you find it accurate and useful, and I will post a revised version on the CSN website. 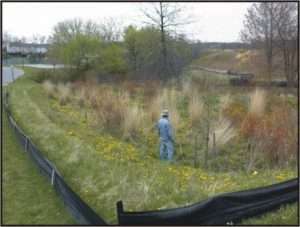 Webcast on the design, installation and maintenance of bioretention, presented by Chesapeake Stormwater Network, Center for Watershed Protection, and LID Studio.